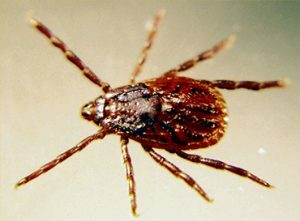 The preventive protects against lone star, American dog, black-legged, and brown dog ticks (pictured), as well as fleas. Elanco Animal Health, a division of Eli Lilly and Co., announced that Credelio has been approved by the FDA. Credelio is a new monthly oral tick and flea option for dogs that contains the patented active ingredient lotilaner, which targets the nervous system receptors of ticks and fleas, not dogs, according to the company. The preventive protects against lone star, American dog, black-legged, and brown dog ticks, as well as fleas. In a field study, 100 percent of Credelio tablets were administered successfully and dogs accepted 94 percent of them when offered by hand, in an empty bowl, or with food, according to the company. The product’s active ingredient—lotilaner—circulates in the dog’s blood stream, targeting the receptors of ticks and fleas when they bite the dog. In clinical studies, it killed 100 percent of fleas within 12 hours for the entire month. It starts to kill ticks and fleas in just four hours; when given with food, it reaches peak blood levels within two hours of dosing, the manufacturer stated. Credelio will be available in four tablet strengths for dogs and is approved for puppies and dogs from 8 weeks of age and older and 4.4 pounds and greater. Visit credelio.com for more information.